Few animals are as majestic as America's chief living symbol, the venerable bald eagle. A mere sighting of these stately birds of prey perched upon a distant branch or soaring through the air is enough to inspire wonder and awe - but perhaps only slightly less so if she happens to be flying off with your golf ball. 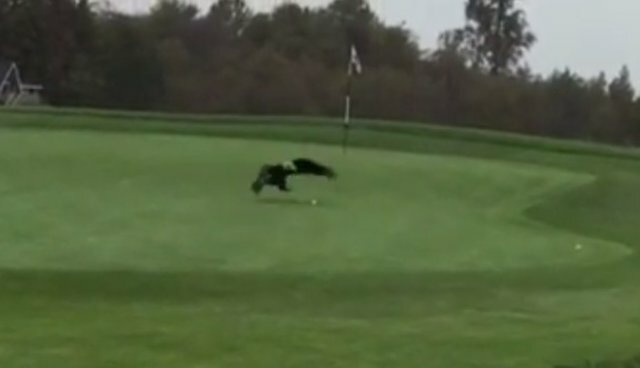 In a video recently uploaded to YouTube by user bonecoho, a golfer out enjoying a rainy day was surprised to discover that what might have been a birdie ended with an eagle. A real one. "The eagle's playing with my golf ball," says the golfer, bemused by the bird even though her happy romping was spoiling what had been a pretty decent lie on the green. But as the man draws closer, the bald eagle suddenly pauses, seizing the golf ball with her powerful talons before taking flight. "Hey, put the ball down," the man says a moment later, watching helplessly as the eagle disappears over the horizon with her dimpled prize. 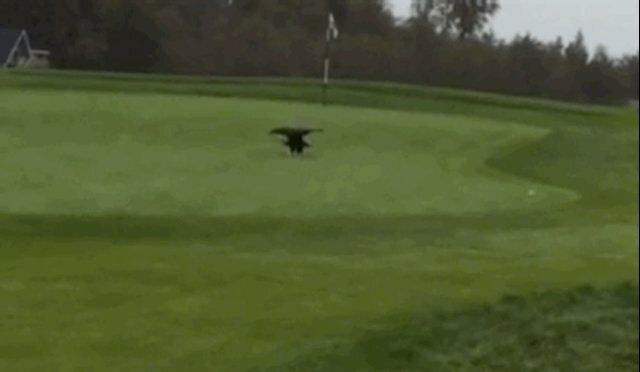 "The eagle just took my golf ball." Unhatched sea birds are among bald eagles' favorite snacks, so it's possible that the beautiful bird mistook the round white object for an easy meal. It certainly wouldn't be the first time that an egg-loving animal has been duped by a ball. The golfer may be out a ball from the unusual encounter, but given the tumultuous history bald eagles have had with humans, it's hardly a huge offense. Despite being America's national animal, the species was targeted by trappers and hunters until the practice was made illegal in the 1940s. That, coupled with the widespread use of the now-banned pesticide DDT which poisoned their food supply, reduced the bald eagle population to just 412 pairs in the contiguous 48 states - down from an estimated 500,000 in the 18th century. After gaining protections under the Endangered Species Act in 1967, however, the species began to recover. By the early 1990s, bald eagles had rebounded back to around 100,000 individuals, repopulating regions where they hadn't been seen in decades. By 2007, the species had recovered sufficiently enough to be delisted - ending a remarkable comeback story a floundering golfer could only dream of.